Free vibrations are oscillations where the total energy stays the same over time. This means that the amplitude of the vibration stays the same. This is a theoretical idea because in real systems the energy is dissipated to the surroundings over time and the amplitude decays away to zero, this dissipation of energy is called damping. 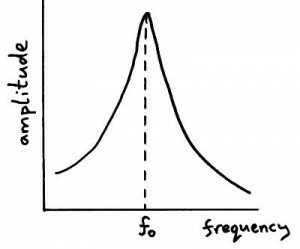 Forced vibrations occur when the object is forced to vibrate at a particular frequency by a periodic input of force. If an object is being forced to vibrate at its natural frequency, resonance will occur and you will observe large amplitude vibrations. 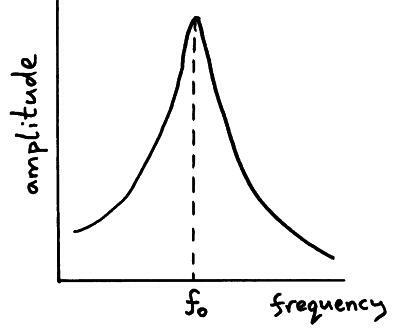 The resonant frequency is fo. Effect of damping on resonance graph. 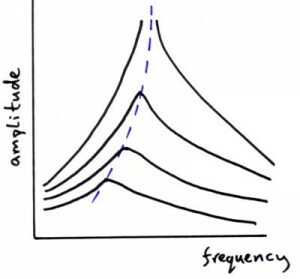 The amplitude of the resonance peak decreases and the peak occurs at a lower frequency. The phase relationship between the driving oscillation and the the oscillation of the object being driven is different at different frequencies. Below resonance they are in phase with each other. At resonance the phase relationship is 90o or p/2 rad. Above resonance the phase relationship is 180o or p rad.